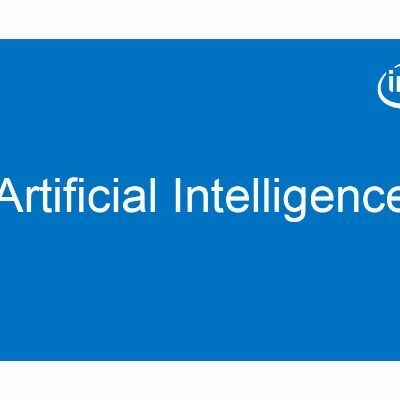 The Intel® Deep Learning SDK Training Tool can be installed and run on Linux* Ubuntu 14.04 or higher and Cent OS 7 operating systems. The Training Tool is a web-application that supports both local and remote installation options. You can install it to a Linux server remotely from a Microsoft Windows* or Apple macOS* machine using the installation .exe or .app file respectively. Alternatively you can install it locally on a Linux machine running the installation script. You don’t need to install any additional software manually as the installation package consists of a Docker* container that contains all necessary components including the Intel® Distribution of Caffe* framework with its prerequisites and provides the environment for running the Training Tool. 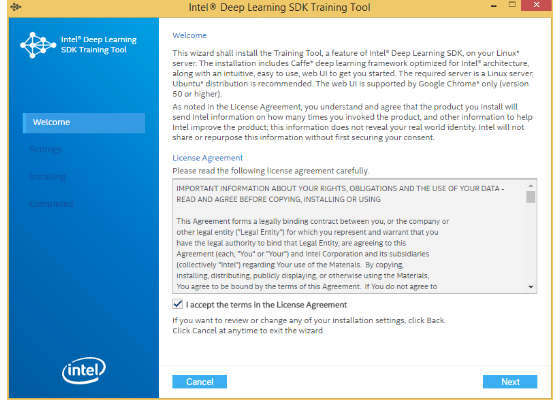 Make sure you comply with the following system requirements before beginning the installation process of the Intel® Deep Learning SDK Training Tool. A Linux Ubuntu* 14.04 (or higher) or Cent OS* 7 machine accessible through a SSH connection. Root privileges to run the installation script on the Linux machine. Google Chrome* browser version 50 or higher installed on the computer which will be used to access the Training Tool web user interface. The system requirements are also available in the Release Notes document that can be found online and in your installation package. 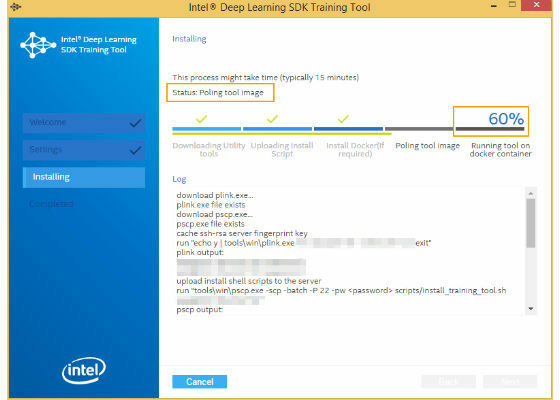 To install the Intel® Deep Learning SDK Training Tool from a Microsoft Windows* or Apple macOS* machine, download the installation package from https://software.intel.com/deep-learning-sdk, unpack and launch the TrainingToolInstaller executable file to start the wizard. The macOS and Windows installation wizards look similar and contain exactly the same steps. 1. Welcome and License Agreement. Read carefully and accept the License Agreement to continue with the installation. User password –The password of the above user account. These credentials are needed for user authentication in the installation process. Web application port - Network port to access the Training Tool web interface. When the indicator becomes 100%, click the activated Next button to complete the installation. 4. Complete. Congratulations! 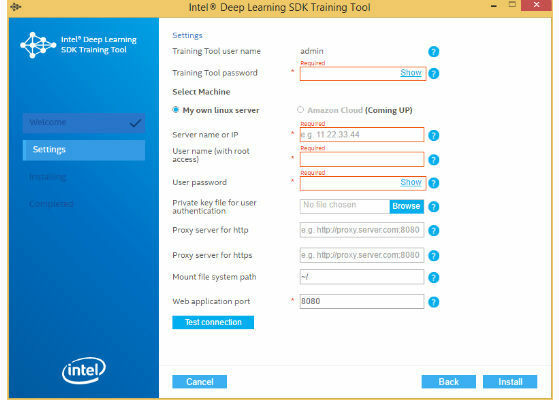 You have installed the Intel® Deep Learning SDK Training Tool on your Linux server. Click the Open now button to open the Training Tool web interface in your browser, or theDownload link to download the latest version of the Google* Chrome browser, or the Close button to close the window. NOTE: While the parameter is mandatory and must be set to continue the installation, other parameters are all auxiliary and can be omitted.